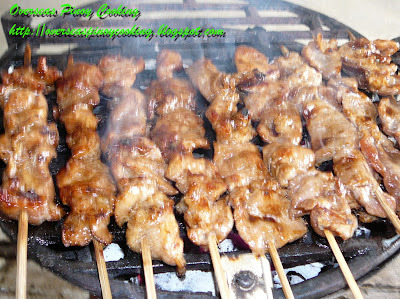 Pork Barbecue is another popular food of Pinoys. It is often sold at neighborhood street hawker in the evenings. Pork barbecue is one of the favorite of children and of course by all. There are no rules on the ingredients of the marinade, from soy sauce with kalamansi to the banana ketchup laden street barbecue or to the worcestershire sauce spiced barbecue of your favorite restaurant. The easiest and fastest way is to use the commercial barbecue marinade. The best barbecue should be grilled just cook with the slight charcoal burnt on the meat. Definitely do not overcook if you don’t like dry and hard barbecue. If its possible always cook in an open flame charcoal grill. Wash pork, remove any traces of blood. Drain in a strainer. Slice pork and cut into 1 1/2 by 2 inchess strips, discard pork skin. 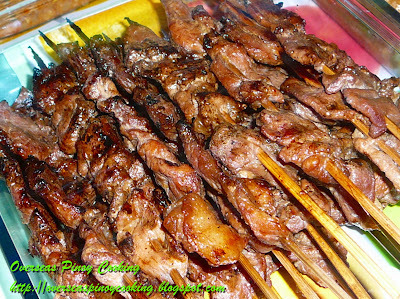 Marinate with Mama Sita’s Barbecue Marinade for 3 hours or overnight in the refrigerator. Skew pork in bamboo sticks, pork with fats skewed near the handle. Prepare basting sauce by adding cooking oil to left over marinade. Grill at medium to high heat for 3-5 minutes on each side, baste in between. Do not overcook, it should be moist inside, just cooked and slightly burnt outside. Serve with your favourite dipping sauce. Looks so yummy! I'll include this one in my barbecue recipes collection. Thanks.